Once you make these, you will tell everyone that I'm your best friend!! It's one of those "tastes better than you think it will" recipes and that has to do with how all of the flavors and textures combine. 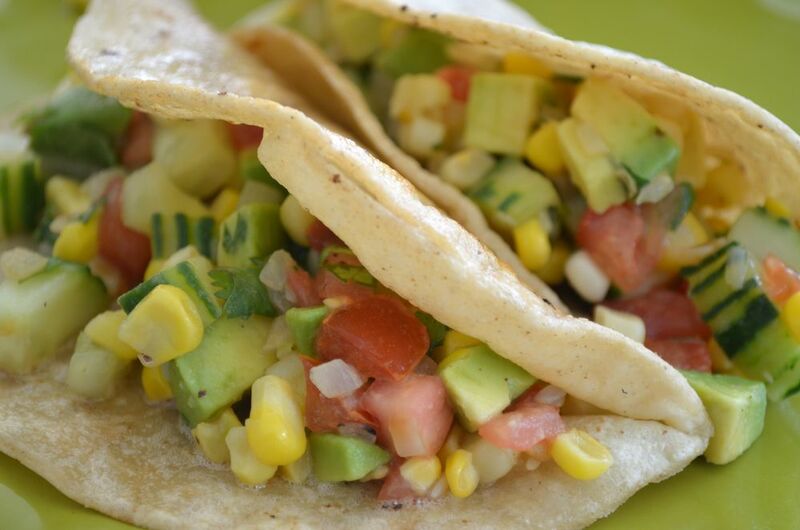 Sweet corn and onions, crunchy cukes, creamy avocado with cilantro and lime. Catch my drift? I started making these after I read Fit For Life, several years ago. I think that the book had a recipe for buttery veggie tacos. They're fun to make and they're so tasty, that they don't require sour cream or cheese (or meat). I guess if you wanted to be a reeeally good boy or girl you could wrap it in lettuce instead of the tortilla. Then you could call it, "My Rad Salad Wrap." Over medium heat, saute onion, corn and chili powder in a little butter (or whatever). Transfer to a large bowl with all of the rest of your veggies. Season with salt, pepper and lime juice. Toss gently. Heat your tortillas in a pan with butter (or whatever) until they're golden, but still soft. Fill 'em up and serve while they are warm.